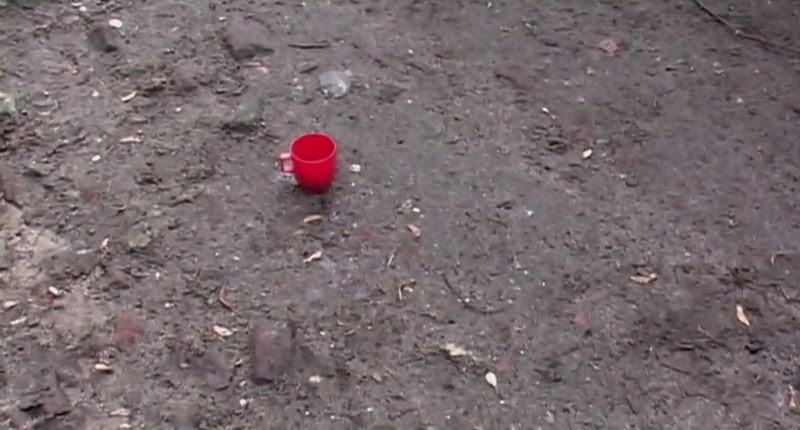 The red cup being thrown on the ground was very similar to a scene in INLAND EMPIRE. Lynch throw bits and pieces of his earlier films everywhere. Would The Return be Lynch's Great Work? I shall add that in both cases, the cups are thrown and land on the ground in the correct position. Prior to the release of the Return I, along with others I'm quite sure, predicted that this would be Lynch's magnum opus. What I did not predict, however, is how much he would reference his own work and the work of others (Kubrick, Hopper, etc.). It's quite a special gift that he has given to his fans. Go raibh maith agat! 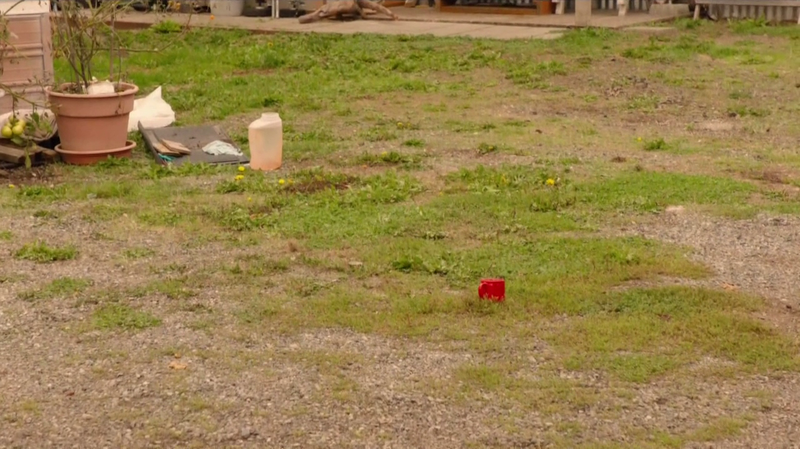 After thinking more about this red cup, I now think it means something in addition to the end/death of proper desire between Becky and Steven. Something like desire that remains upright/persisting, as the cup is violently thrown in the mud, even after relations are dead and the window is broken(end to proper desire). Something like immortal desire for accumulation/profit/enjoyment that persists after the relations are finished, which is why Steven was seeking violent retribution against Becky, turning into Leo, etc., stone faced criminal, violent, etc. This excessive desire and drive to destroy a situation is not in-itself 'bad', just to be hidden from, etc., which will just make you stuck in a bad situation, forced to enjoy it, etc., unable to change it, change the frame/form of the whole situation, new law, etc. Not confronting this necessary dimension of void/impossibility, that there are no atoms/nature/stars, and hiding from this excessive desire and drive to transform an impossible situation that rests on void, is the white cover for the black evil, the black evil which is ignored, since this excess is not dealt with in a proper way, bringing justice and fixing the entire situations frame/form/law, so that the same problems dont re-occur. Thus characters like Red and Jean Michel proliferate, while Johnny is denied his excessive drive to stop these types (Richard) by a 'white' Sylvia who hides from the excess and how she secretly participates in it(revenging against Ben and torturing Johnny/Jesus who was trapped in and killed by a world, betrayed by all, both white and black, a world which he was denied the ability to change/fix, even though his whole life points to that moment). Sylvia hides from this necessity of excess, thus cannot properly deal with it(cannot make him mad, then she herself tries to get Ben in the same way Ben got her, white becomes black, Mike takes garmanbozia from Bob after Laura's murder, even though he tried to cut off his arm, the cutting off is the hiding from whites necessary failure which demands excessive transformation). Sylvia instead tries to pretend that torturing her middle aged son is a normal family life, with robot teddy bear and cookies. This is also the same reason why Becky and Shelly go over to characters like Red/Leo, etc. I am actually starting to like Miriam somewhat more now, her excessive enjoyment about the pies represents how the old twin peaks failed with the death of Laura, and how people are hiding from it, it was killed by the vicious white-black dynamic that creates reciprocal destruction and traps people in the failing system of the old twin peaks, ties johnny in a chair, and allows no one to solve the problems, out of fear that someone will get hurt, well the entire situation needs to be destroyed/hurt, it is the source of more violence and brutality that needs to be forced into a successful law. In other words, to save what was good about the old twin peaks(Miriam's pies, etc.) the entire situation has to be changed in its form/law. The excessive drive to destroy a failing situation is not necessarily 'bad' and is even necessary to open up the freedom to change the entire situation, it is 'void' embodied in life, the complete disgust with an unjust situation and wanting to 'tear it up'(like how Bobby treated the evil community hiding from the Laura tragedy at Laura funeral). This sort of excessive(gold) drive is the key to solve all of the problems, and must be properly dealt with, to hide from it means the true evil, the white cover for the black which gives black shelter, why the docile dougie pretending to be gambler/hedonist gives shelter to Mr. C/billionairs to treat the government as their private mafia/terror force, making the world their capitalist playground, killing and torturing/enslaving anyone who stands in their way, the world and state is their private property. Not going to excess of tearing this situation up, hiding from it because its 'bad' is completely wrong, a bad situation/frame will look bad and should be treated as such. How to deal with this excess properly? Carl Rodd is the example here: after being in the 'brown' with Mickey and complaining about the government(frame/law, responsible for putting law and conditions of life), he looks to nature(background, how life is going naturally, etc.) with desire/red, calms down from the 'brown' and thinks about a good way to get out of it, enjoying the community, promoting dignified life, etc(red river song). He then sees the kid get hit, and here is how he deals with the golden excess: the burning flame to change the situation, he sees the horror of how things are made by people(watch stop/controls/interacts with time/space, etc., and this interaction must be changed), how could such a mother and kid be killed, etc., its a nightmare, government/billionaires alliance is called 'damned', dont do anything but drain people, kill them, take for themselves, ruin the green(nature/law) and destroy the proper way to deal with the golden excess and the 'brown' which you hit when you see impossibility void; here gold should go to fixing the problems/injustice, it is the duty of thinking-speaking beings who have this power to change the frame to do something about it, etc., not hiding from this painful excess that upsets life....The golden shovel approach is a way of hiding form impossibility/void(no stars), desire fails, goes to the red room, infinite horror and pain mixed with crippling impotence, and it only leads back there. To go back right into excess from being in the brown without solving the problems, like Richard in the truck, means a maddening downward spiral that ends in violence and barbarism, a spiral that characters like Mr. C and Red try to master with magic but only ends in one way, their death...(BOB tells Windom Earle, you cannot kill him, etc., always happens here, like the guy from lost highway who killed the mafia, headed for death, no way to get rid of tracking devices, have to fight to fix the problems, see the pain and deal with it, fight for justice, etc., also why Mr. C is hiding like the White, they are both hiding from treating pain as pain, bad as bad, hiding from void/impossibility, that this 'brown' will never go away, that 'she is gone')(or capitalism will end in barbarism/slavery to the robot teddy via digital internet network linked with AI and human body). Actually my first thought was that with a cup, you can "drink full". And descend. Sounds like those two have descended!